Daryl Johnson (Worcester Park, United Kingdom) on 31 October 2010 in Architecture and Portfolio. It sounds obvious, but... I was seriously impressed with the Eiffel Tower. I remember being told that towers in Japan such as Tokyo and Nagoya Towers were based on the Eiffel Tower, so I was honestly expecting something on a similar scale. How wrong I was. The tower absolutely blew me away when I finally saw it, and I was impressed every time I saw it, different days, different locations. I couldn't get enough of it - Magnificent structure! An unusual shot of this grandfather of a tower. Hello, nice to see you again!!! I hope all is wright for you!! @Marc: Merci Marc! Internet and software are fine now...! Wow, what an interesting framing, very nice! Too bad the weather wasn't helping but the reflection of the wet tarmac really helped this shot! Beautiful framing and excellent B&W! I like this angle. I have some by night in a similar angle ... wide angle lens was a wise decision for the tower. Superb framing Daryl, and B/W is the perfect choice. 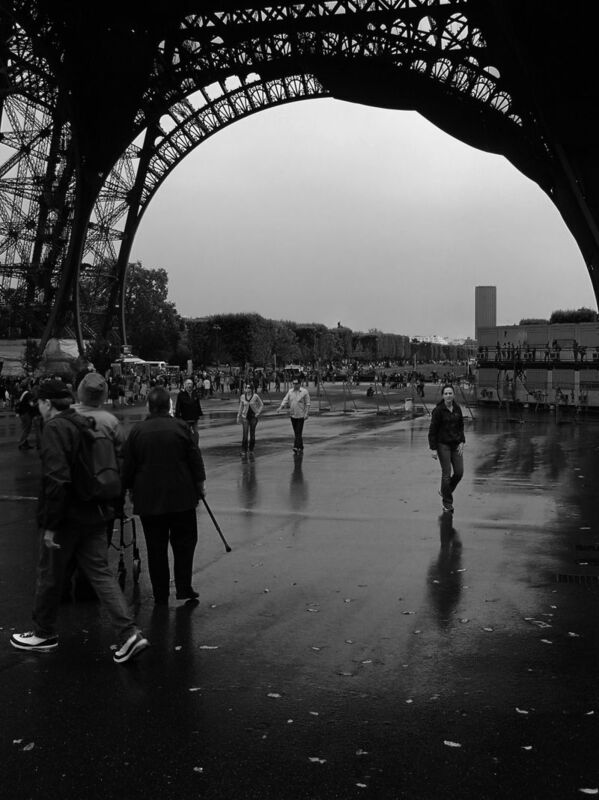 (it rained when we went to Paris too). @Michael: Cheers Michael! Actually, this was really our only rainy day, luckily. @Japanalia: Thanks Gabriela. Don't know that building... will have to check.